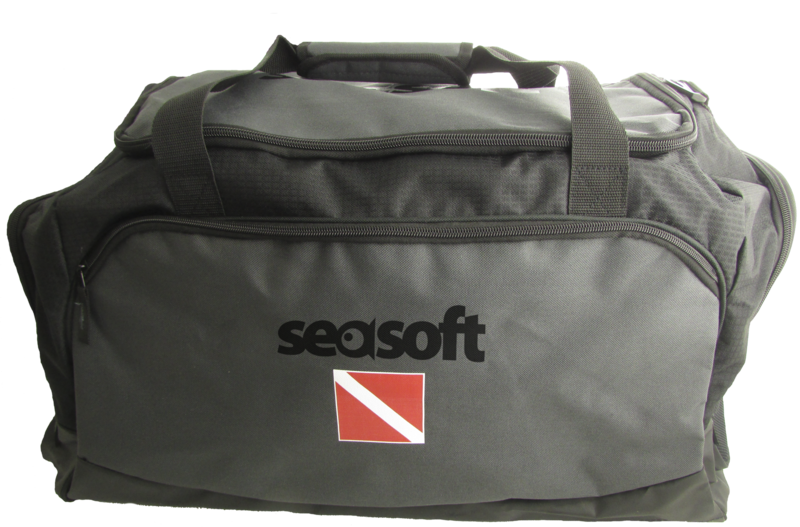 SEASOFT's new "RANGER" Gear Bag is an economical, easy to use, tough gear bag. It has 6,300 sq. inches of storage in this perfectly sized gear bag at H15" x L30" x W14". Now you add the two end pockets (one with expanded space), the big front pocket and a mesh pocket and you have all kinds of places to stash your dive gear. There is also a very handly interior pocket for accessories like de-fog, zipper wax etc. The "RANGER" is made with medium weight CORDURA™ polyestor fabric and the bottom has an abrasion resistant and waterproofing coating for longevity. There is an extra thick padded shoulder strap, two sturdy handles and a bright dive flag on the exterior. For a very competitive price you get a whole lot of bag. a great bag for your wetsuit and accessories, drysuit or your regular dive gear. If you like your gear organized then this is the bag for you!